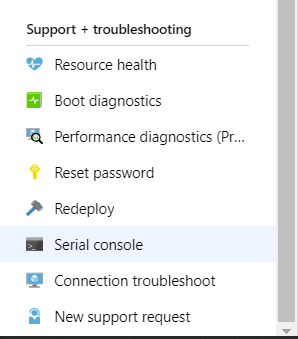 Azure is a great service for hosting virtual machines, however sometimes VMs get into trouble and aren’t able to boot… Then you find yourself longing for a keyboard and screen connected directly or via Hyper-V or ESX. Alas don’t despair there are two options that may help! to get to a command prompt after entering administrative credentials. There are cases where you can’t get a serial console to work, one recent case for us was a Domain Controller that kept throwing a 0xc00002e2 stop error, which means ADDS is unable to start. Normally you would start the VM without ADDS running and work out what happened. Often it is a disk that failed to come online, which has happened to us a few times with on-premises VMs after Microsoft patching/reboot. Of course in Azure you can’t press F8 to get to the Advanced Boot Options menu. True but you can create a VM within Azure that runs Hyper-V which uses the disks/snapshots of the broken VM to create a VM where you can press F8! OK I admit that is a bit of a mind meld but it does actually work! Once complete then shut down the Hyper-V host VM, remove the disks and add them back to the original VM within Azure and done! Twan is a senior consultant with over 20 years of experience. He has a wide range of skills including Messaging, Active Directory, SQL, Networking and Firewalls. Twan loves to write scripts and get deep and dirty into debugging code, in order to understand and resolve the most complex of problems. Nero Blanco IT Limited is a company initially formed by highly skilled and experienced independent contractors who saw a problem with how large technology migration and consolidation programs were undertaken.